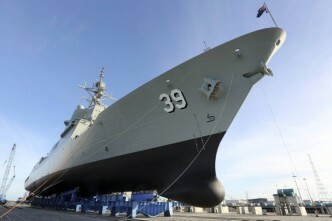 The Australian government is about to deliberate on the combat management system (CMS) for the navy’s future frigates. In the mix are Saab Australia’s 9LV, which is already working well on the RAN’s Anzac class frigates, and the US Navy’s Aegis system, a version of which is in the Hobart class air warfare destroyers (AWDs) that are now starting to enter service. The question that people keep asking is ‘Which will be chosen?’ We think that’s the wrong question. A much better one is ‘How can we maximise capability?’ If Defence has addressed the problem that way and advised government accordingly, it’s possible that the answer will be ‘We’ll take both’. To see why, it’s useful to baseline the capability and advantages of the ‘competing’ (though, for reasons that will become clear, we’d rather say ‘complementary’) systems. The Australian-designed and -built CEAFAR radar is the government’s preferred radar for SEA 5000. That’s a very sensible position—not for parochial reasons (heaven forbid that such reasoning could sneak into government naval shipbuilding policy)—but because it’s the highest-performing radar currently available. So far, it’s installed only on the Anzac-class frigates, tightly integrated with the 9LV CMS. When the government sits down to deliberate, one of the most important things for it to inquire about is the relative efficacy of the 9LV/CEAFAR and Aegis in the areas of electronic warfare and short- to medium-range air defence. The Australian combination has been demonstrated in trials to be effective against sea skimming supersonic missiles, one of the most challenging air defence threats a vessel can face. All are indications are that the CEAFAR/9LV-equipped Anzacs currently have the world’s best air defence on surface combatants over short to medium ranges. We don’t have the classified data to confirm that, but the government should ask to see a direct comparison. Similarly, it should ask about the ability of the two competing CMS solutions to fully exploit the sophisticated capabilities of the CEAFAR radar. Aegis also comes with some significant advantages. 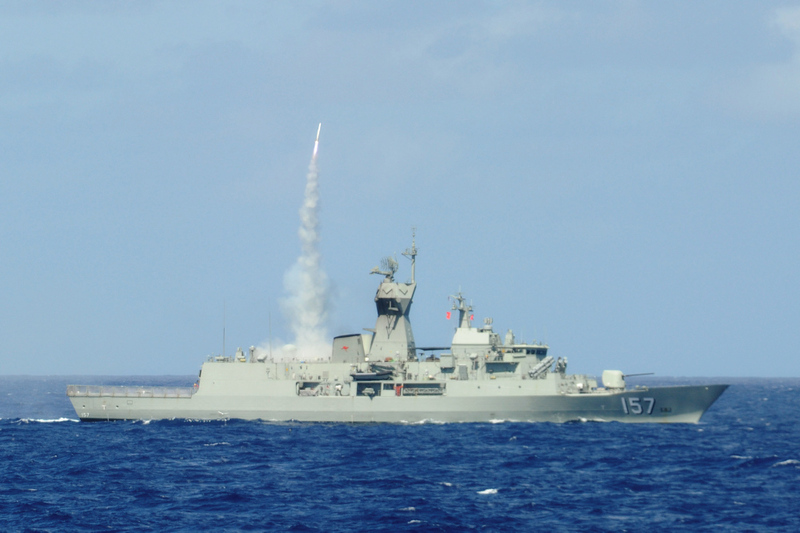 Unlike the Anzac air defence solution, which is currently limited to the approximately 50 km range of the evolved sea sparrow missile (ESSM), Aegis has an established layered defence capability out to the significantly longer range of the SM-2 weapon (upwards of 150 km), improving the vessel’s survivability against complex threats. At shorter ranges it uses the same ESSM weapons as the Anzacs, but it can select long-range weapons when appropriate. The latest Aegis baseline 9 is a more modular system than previous versions, with much-improved hardware and software architectures, making it easier for a user to pick and choose among various capabilities. (The RAN is nonetheless getting baseline 8 in its brand-new AWDs, but that’s another story.) Among the modules are two that bring functionality not currently found on Australian vessels—cooperative engagement capability (CEC) and ballistic missile defence (BMD). 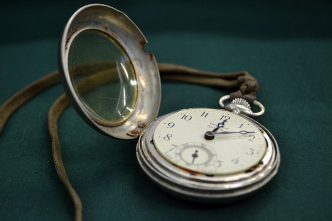 There was no requirement for the Anzacs to have either of those, so they are not features of 9LV, though both could be included as part of a future growth path for the system. CEC and BMD are not requirements for the current SEA 5000 competition, but the government might reasonably want to know about future options to include them. If Australia decides to pursue a naval BMD capability—a possibility that looks more likely with each North Korean missile test—the USN’s Aegis solution is a natural fit. It’s not clear that BMD would be considered for the future frigates, which are intended to focus on anti-submarine warfare (ASW). But the contenders are all large vessels, so the potential will be there if the need is established beyond a possible BMD upgrade for the air warfare destroyers sometime in the 2020s. Adding BMD capability to the future frigates would almost certainly be more complex than for the AWDs, even if Aegis is at the core of the CMS. That’s because a cohesive BMD solution requires integration between the CMS, the radar, the interceptor missile and off-board sensors that can detect a ballistic missile early in its flight. Making a CEAFAR-equipped vessel BMD capable will require either a bespoke 9LV BMD solution or a high level of integration between CEAFAR and the Aegis CMS, neither of which have yet been done. Of course, the SEA 5000 vessels are intended to be anti-submarine warfare (ASW) frigates first and foremost. In the Anzac frigates, the 9LV CMS interfaces directly with the sonar and other systems. The tight integration that has been achieved is beneficial for ASW operators, and there are good reasons to carry that forward into the future frigates. The underwater systems in the USN’s Aegis-equipped vessels are managed through a separate module that’s packaged as part of the Aegis suite, but is largely independent of the air warfare modes. A similar solution was found for Australia’s AWDs, for which Aegis handles radar management and air warfare, and a bespoke ‘Australian tactical interface’ (ATI) provides integration of a subsidiary combat management system. The ATI is responsible for controlling and processing data from some of the ship’s Australian-selected additions, including ASW sensors and decoy systems. The table below summarises the current state of integration between the two CMS candidates and other systems. We’re aware that some risk reduction work that has been carried out in support of the SEA 5000 competitive evaluation process, but there’s no publicly-available information on the results. Based on what’s known, if the government were to choose either CMS exclusively, it’s likely that some capability would be traded off, extra integration work would become necessary, or—most likely—both. We wonder if there’s a hybrid approach that builds on the strengths of all of the systems on offer. The ATI solution on the AWDs and the modular nature of the Aegis architecture show that it’s possible to partition the tasks of combat management systems for different roles. So it might be possible to combine the proven world-class short- to medium-range CEAFAR/9LV/ESSM combination with the layered defence and long-range capabilities of Aegis solution. One way to do that might be to employ Aegis as a data and weapon management system, but share control of the radar. As has been shown in the highly successful Anzac frigate upgrade, the 9LV system can exploit the CEAFAR’s capabilities and can also manage the ASW sensors and other systems (Hawklink, electronic warfare, tactical datalinks, the ship’s gun etc.). Of course, that’s easier said than done, and we’re well aware of some past unhappy experiences in systems integration. Before heading irrevocably down that path, some rigorous systems engineering work that follows on from the existing risk reduction work is required. But we think that CEA, Saab Australia and Lockheed Martin have all demonstrated the ability to make things work. It’s an enticing prospect—Australia’s future frigates could become some of the most capable vessels in the world. 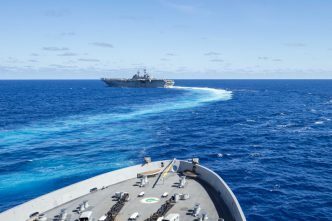 And with Canada and the US both contemplating their own frigate requirements, there’s a chance to share technologies and networked capabilities across a five eyes community. Not least from the government’s point of view, producing a world-class solution with Australian components at its core would enhance the prospects exports of Australian IP and hardware in the form of CEAFAR and 9LV. The ANZAC ASMD outcome is good testament to the sovereign capability to develop, implement and integrate systems of equivalent complexity. For all those reasons, we think the government should be prepared to think flexibly about the full range of possibilities. Andrew Davies is senior analyst for defence capability and director of research at ASPI. James Mugg is a researcher at ASPI. Image courtesy of the Department of Defence. 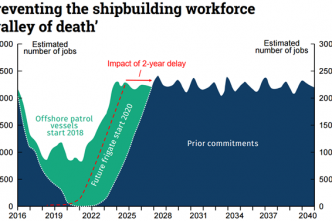 Shipyard jobs and North Korean missiles—two birds and one stone? An upgrade for the Air Warfare Destroyer—already?